Madh Marve, currently an untapped locality in the western suburbs is expected to outshine other localities in Mumbai in the long term, according to popular belief. 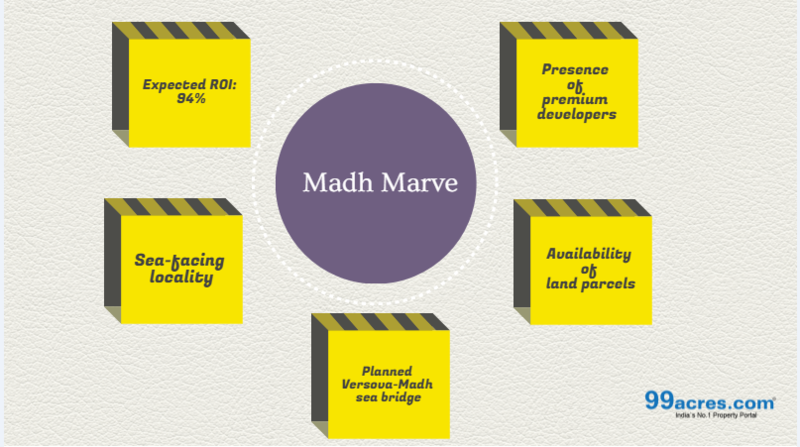 A recent report by Knight Frank has brought Madh Marve to the limelight. The report claims that the locality will witness a 94 per cent appreciation in the next five years. Located in western suburbs, Madh Marve is yet to grow to its full potential. With huge parcels of land lying vacant, the locality will soon transform into an ideal residential and commercial investment destination. Geographically, Madh Marve road is an 8 km stretch originating from Koliwada in Madh and ending at Marve Ferry Point. The Knight Frank report has listed Madh Marve in the top 11 residential investment destinations in India. Experts opine that if timely infrastructure development takes place, the available land parcels will be grabbed by developers for developing residential projects. Currently, the average capital values in Madh Marve are around Rs 12,000-Rs 15,000 per sq ft and is projected to run parallel to Lokhandwala where the prices are at Rs 23000 per sq ft. According to Niraj Agarwal of Agarwal Estates, Mumbai, "Madh Marve is surrounded by well-known residential localities like Charkop, Malwani, Chicholi which offer affordable accommodation for mid-income size groups." In addition, the presence of locations like Malad and Mindspace, which offer large office blocks and can generate employment are very close. Madh Marve is well-connected via the BEST buses and auto rickshaws. Apart from the road, another high point is proximity to Malad station which is part of western railway route in Mumbai. The upcoming Versova-Madh Sea Bridge and Nariman Point-Kandivli coastal freeway will ensure seamless connectivity with the millennium city. Madh Marve location is replete with social infrastructures like educational institutions, healthcare and entertainment avenues. The locality boasts of schools like Kendriya Vidyalaya at INS Hamla, St Bonaventure High School in Madh, St.Anne's High Scool & Junior College in Marve Road and colleges like Atharva College of Engineering, Atharva College of Engineering, BMC College in Marve Road. Marve Hospital, Adarsh Hospital and Atlantis Hospital are equipped with basic and utmost healthcare facilities. Madh Marve is considered to be a weekend destination with the presence of some of the popular attractions like Church of St. Bonaventure, Madh Fort, Essel World and Aksa Beach. It is hoped that once developers acquire more land for setting up residential projects, entertainment options like shopping complexes, malls and recreational destinations would follow suit. Very few developers have set their presence here so far. Some of the reputed names include Raheja, Rustomjee, Abrol Builders in and around Madh Marve. It is believed that these builders are focusing on launching luxury residential projects alongside the Arabian Sea. With seamless connectivity to the premium office spaces, it is expected that the housing demand in Madh Marve would be unparalleled, adds Niraj.